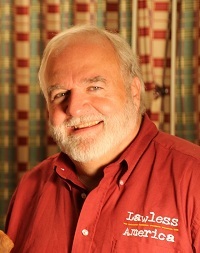 Bill Windsor has recorded a Lawless America Update on Day 158 of the Lawless America Movie Road Trip. Bill talks about the status of the filming of the movie, the Congressional Testimony, the Meet Me in DC event, and much more. Please spend 45 minutes and view this video, especially if you have been or will be filmed for the movie. It's the Lawless America Revolution, and we must have your support and help. One feature length documentary movie is being produced. It will be shown in theaters, should be available on Netflix and other such video places, and the movie will be presented to the Sundance Film Festival and other film festivals. In addition, videos will be produced for each state and for each type of corruption. Everyone who is interviewed for the film will record a three-minute segment that will be done as testimony before Congress as well as a 30-60 minute on-camera interview with Bill Windsor, founder of LawlessAmerica.com and GRIP. The legislators in each state will receive the testimony from those in their state, and the members of the U.S. House and Senate will receive all of the testimony nationwide. Over 1,500 people have already been interviewed for the movie, and approximately 6,000 have asked to be filmed. We will continue to accept as many requests as possible. A 50-state road trip took 241 days. This was the itinerary for Lawless America...the Movie. The road trip started in Atlanta and headed North and traveled counterclockwise around the country. Upon the return to Atlanta, Bill Windsor will flew to Hawaii and will fly to Alaska. For those unable to travel to attend scheduled filming sessions, you can still appear in the videos by recording your own video or by being interviewed on camera by Bill Windsor using a webcam and Skype. Webcams are available on loan to those who need one for their interview.